We’ve all been to those parties (or at least heard of those parties) where people exchange cookies. The idea behind these parties is that each person leaves the party with a vast number and variety of cookies for all their holiday entertaining needs, although if by “people” you mean “me”, at least two-thirds of those cookies will be consumed solo while watching Miracle on 34th St. Since we can’t actually send cookies through the screen, author Linda Poitevin (author of the Grigori series) put together this Virtual Cookie Exchange, in which we trade recipes. Linda kicked things off with Snowballs. The following week Mia Marshall, urban fantasy author, shared a recipe for Urban Legend Christmas Cookies. Marie Bilodeaux, science fiction and fantasy author, shared Chocolate Chip Cookies of Might and Magic. Kerry Schafer shared her recipe for Melting Moments. Kerry writes urban fantasy – and also has a blog with a gorgeous design that I covet. Not to be outdone, D.D. Syrdal took a break from writing about vampires to post a recipe for Ruby Linzer Bars. Persimmon Cookies are a family favorite that my Grandma Mac always made. After she died, no one made the cookies, because we couldn’t remember what kind of persimmons to use (hachiya), but at last the secret was unearthed and I can make the cookies again. They are so closely associated with my grandmother that the first time I baked them for my mom she cried. My grandmother was never going to win “Mother of the Year”. She encouraged sibling rivalry between her six children to suit her own ends, and placed high demands on the older children in particular. She failed to protect them from predators. She said horrible things to them. Of course, while my grandmother’s love for me was as unconditional and unchanging and unreserved as Dog Love, it was much more complex and densely textured. Sometimes she was the boss of me. Sometimes I was the boss of her. She thought Picard in Star Trek: The Next Generation was cute (so did I). She also liked the Lawrence Welk Show, thus proving that an individual’s taste can be varied. These cookies require persimmons that are old. That period when they are firm and shiny and look great? Not their best time. In that state, they are bitter and harsh and hard. Leave them on the counter and walk away for a couple of weeks. They have to sit on your counter for so long that they are totally mushy – like, almost soupy. That mushy goo, when mixed with flour, eggs, shortening, sugar, and spices, makes something sweet, rich, and full of nourishment. Whenever I make these cookies, I remember Grandma Mac, and I think about how sometimes we have to wait for a long time before we turn into something sweet and nourishing. Beat pulp, baking soda, sugar, and shortening until creamy. Add egg. Sift flour with spices (confession – I just dump everything into my Kitchen Aid mixer). Add to creamed mixture. Stir in nuts and raisins. Drop spoonful on greased baking sheet. Bake at 375 degrees for 12 – 15 minutes. Makes about 3 dozen cookies and a lot of memories! 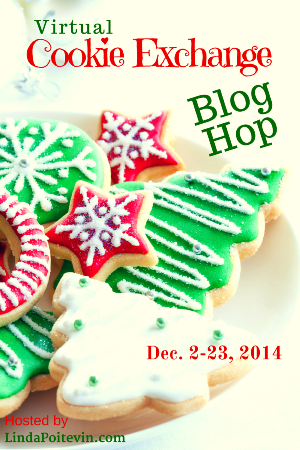 This entry was posted in Rants and Raves and tagged cookie exchange, food and memory, holiday cookies, Linda Poitevin, mia marshall, persimmon cookies, virtual cookie exchange blog hop. I love this recipe, and I love your story even more. Thanks for sharing, Carrie. Happy holidays! And same to you, Ellie! As an ethical vegan I found out that eggs and milk can be replaced. I find almond, coconut, or hemp milks are my favorite to use, but other plant milks can suffice. One of my favorite egg replacers is “ENER-G” which is available at health food stores or online.